I’ve always been a fan of all things Virgin, back in the 90’s, it was my airline of choice when I worked in the US . 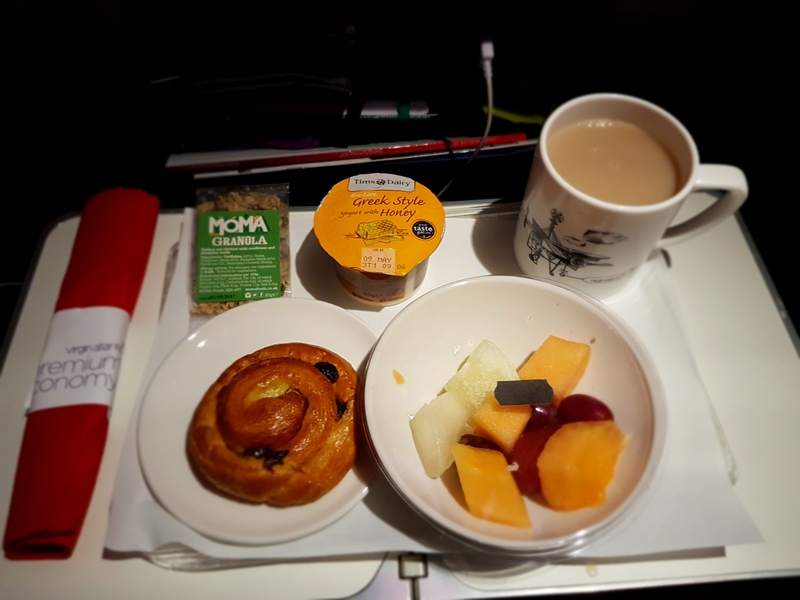 My last jaunt on Virgin Atlantic was well over a decade ago, so I was excited to get back onboard to see what they had to offer. Here’s my onboard Premium Economy experience. Upon boarding I found my seat with a pillow & blanket and an amenity kit placed in the seat pocket. The pouch was by trendy bag brand Herschel and definitely worth taking home, though its contents were pretty disappointing. 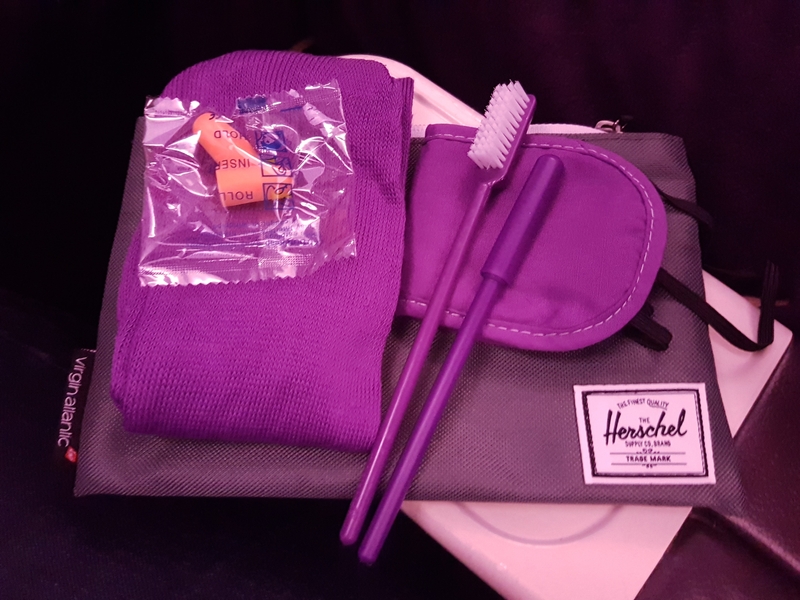 The kit contains a basic toothbrush & toothpaste , pen , eye shade and socks. I suspect by the quality, its what was previously given out in economy, which has now been shifted up to Premium Economy. That said , i did use the eye shade and toothbrush and I took the pouch home , which i intended to use as a make up bag until it got swiped by my teen as a pencil case grrrr. After taking my seat I was offered a complimentary glass of champagne for take off, sadly this was the only time complimentary champagne was offered during the flight. 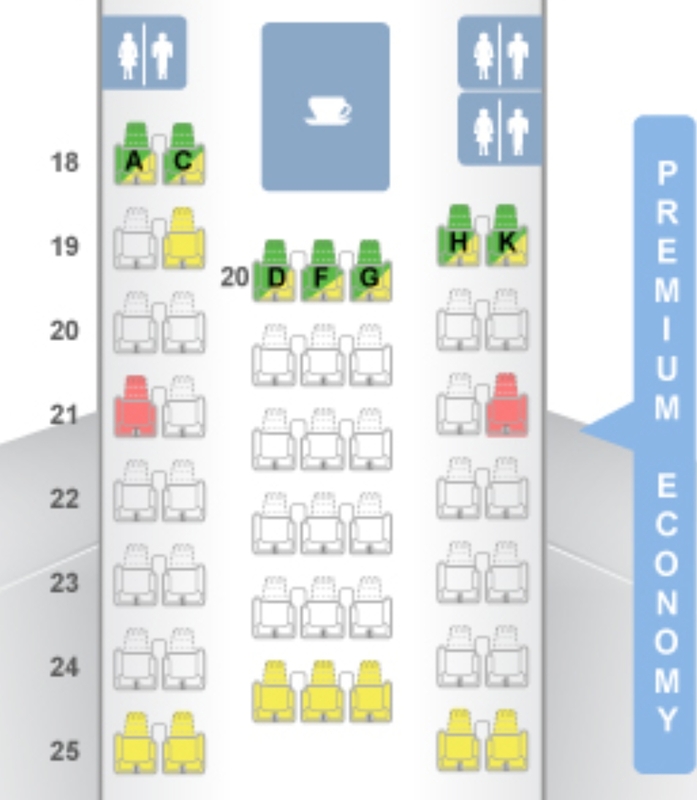 Premium Economy is located in it’s own cabin between Upper Class and Economy from row 18 and 25. 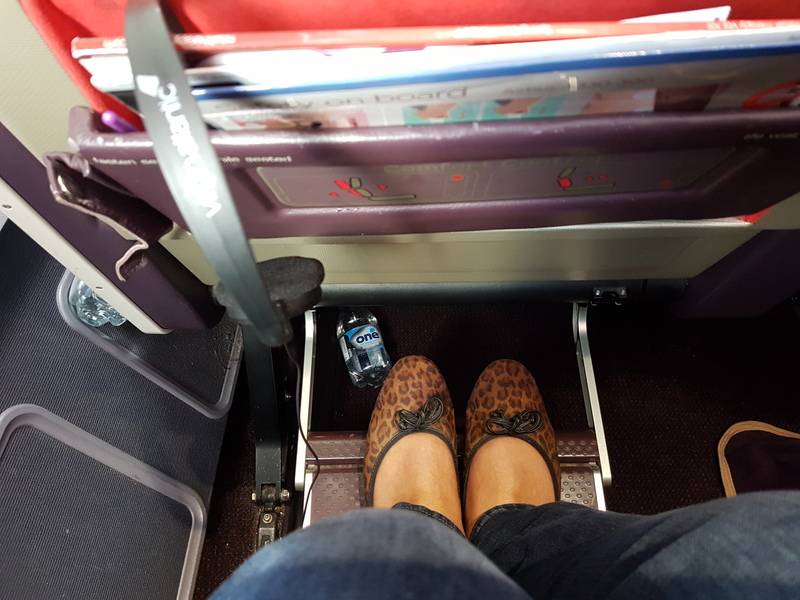 The seat was comfy and spacious, upholstered in Virgin Atlantic’s signature purple leather, with a generous seat width of 21 inches and 38 inches of legroom. The central arm rests is an extra flat surface for drinks to be placed, and there’s also a pull out footrest for extra comfort. The seat back TV’s are 10.5 inch touch screens with the remotes located in the side of the armrest and a handy USB socket for keeping everything charged. There is an extensive library of movies , TV , games and music system called Vera ( nope me neither ) which is guaranteed to keep even the pickiest viewer entertained. The headphones are the same as the economy cabin and pretty poor quality, so I’d strongly advise to bring your own. 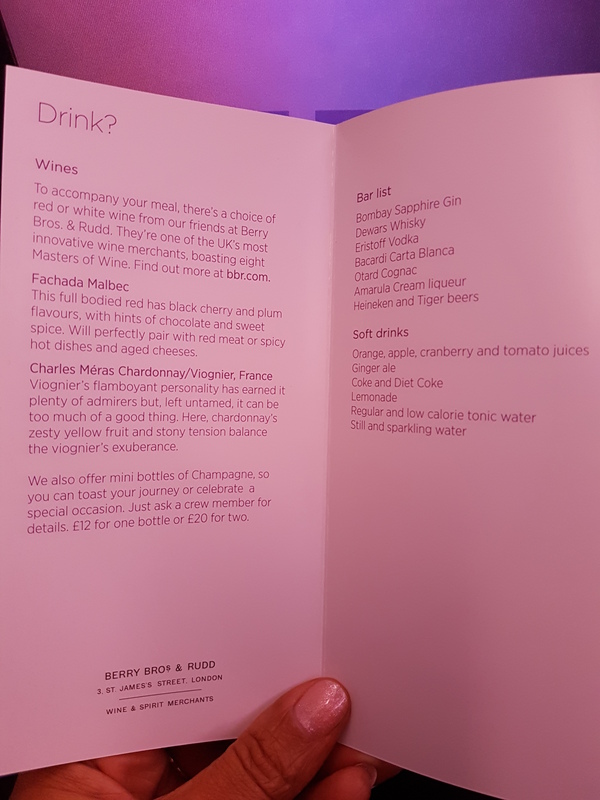 As this was an evening flight ( 10pm departure, delayed until 10.30pm ) the drinks service started promptly approx 30 minutes after take off , with the usual spirits and snacks, I was sad to see they no longer serve Virgin Vodka. Food menus were handed at the same time as the drinks service for the evening meal which was served shortly after. The evening meal came with one starter option , a salad and then a choice of Beef & Mash , Chicken Tagliatelle or Vegetable Curry. I plumped for the Beef and Mash which despite appearances was hot, tasty and very filling. The meal also came with a delicious mango cheesecake and cheese and crackers. The meal ended with a nice touch , tea served in a proper china mug lovely !!. As soon as the meal service ended the lights were turned off in the cabin, as it was nearly midnight UK time. I found the seat pretty comfortable to sleep in. After a getting nearly four solid hours of uninterrupted sleep , I was woken by the cabin lights being turned on for breakfast. Sadly no hot items were served, but as it was less than an hour to landing the fruit salad, yogurt and danish were fine with another mug of tea until i made it into the terminal. With fares on this route sometimes as low as an extra £100 on top one way of the economy fare , its definitely worth stretching the budget a little for an extra 7 inches of legroom. 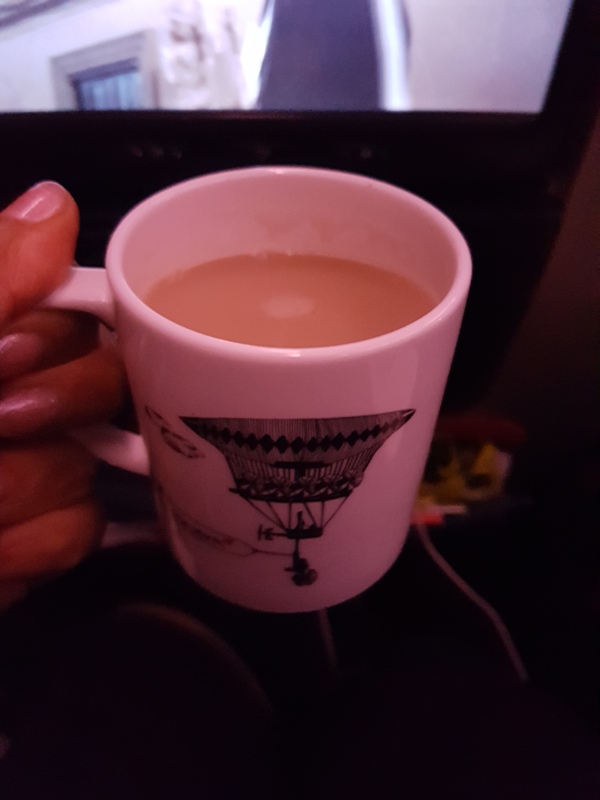 My Premium Economy experience overall was a positive one , I particularly liked the small cabin which means service from the crew was prompt , plus as there was a bathroom located either end of the cabin, so there was no stream of people walking through, and I loved the mugs of tea. I was initially worried that the leather seat would be uncomfortable to sleep in, but i actually managed to get a good sleep which is no mean feat on a plane, but it turned out to be pretty comfy. I didn’t like the deep seat recline though as I was literally watching the top of my seat mates in front’s head. If i were to fly this cabin again, I would try and get a bulkhead seat, but all in all a good experience, which I would recommend. We just traveled from Manchester to Orlando on Virgin Atlantic and as per usual the service was top notch. Their flight attendants are incredible and always go out of their way to make your experience enjoyable. We weren’t lucky enough to get the upgrade but we were able to take advantage of the three open seats that were behind us! Never had a bade experience with these guys, and they keep getting better. its def worth upgrading ecen one way i usually do one way economy on a day flight then one was PE / business for a night flight . best of both worlds !! i hate packed flight but orlando is always going to be a full one the only thing that bugged me was the purple lighting !! Seems to be a good experience! This is elaborate experience sharing, thank you for sharing the experience, looks like more than decent flight option at the price you mentioned. If you can get it for an extra £100 each way its Well worth it !! Thank you i like to ensure everyone is informed !! Virgin Atlantic was definitely my airline of choice when l lived in the States as well and flew the L.A- London route quite a few times. In those days too, l got bumped up to first class at least 3 times. It’s nice to know the service is still awesome. Would love to fly them again. Yeah up front is the way to travel ! !